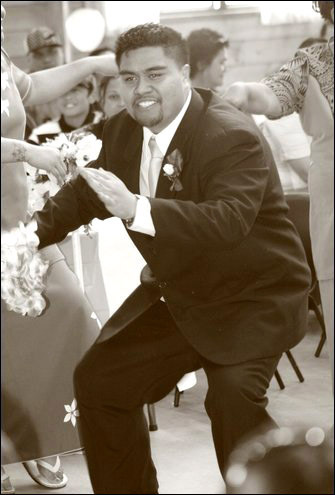 Hey Geoffrey here is a picture of myself, doing a semi-traditional Samoan (Polynesian) dance at a relative's wedding. Lots of food and tons of joy. Well let's see, I love the love of wisdom because I believe that Philosophy is an awesome vehicle in pursuing truth, obviously I come from a worldview which presupposes that such a thing as 'truth' truly exists, in an objective sense and not a relativistic sense. Reading, writing, lunting, watching movies, music, talking and enjoying time with family and friends defines my life in a nutshell. Study and work, well, are necessary 'evils' as they say haha. Living in the 'land of the long white cloud' - New Zealand, pretty much makes me a bona fide Kiwi, I enjoy it here in the country side very much. Frequent trips between the country side and the city (once every two months most times) for work, family and friends gives a new substance to the saying "life as a journey". I hope things are well in England, my paternal Grandfather was from Uxbridge, Middlesex. Hopefully I will visit England, maybe study there for postgraduate studies? Who knows how destiny will unfold! On closing, I would like to say a sincere thanks for everything you have done Geoffrey in making Philosophy open and free to anyone and everyone who has an interest in it, helping to fan the 'flame' of wisdom so to speak. P.S. Here are two links for web sites which I frequently keep track of, and keep in touch with actually. Please add them only when you can slip them in, I know you are very busy.